A delightful animal tale for bedtime or anytime. 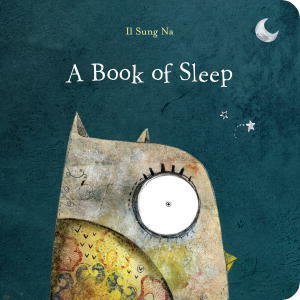 Il Sung Na writes a simply sweet story of a night owl who witnesses a variety of sleeping creatures and their unique ways of snoozing. The playful, artistic illustrations made me smile and my daughter laugh. Phrases such as “some sleep with one eye open” encourage a child’s wonder and curiosity while the art titillates the imagination and tickles the funny bone. Easily manageable for a small child as a cozy board book. This book looks and sounds adorable! I’m always looking for bedtime books for my 2 year old!